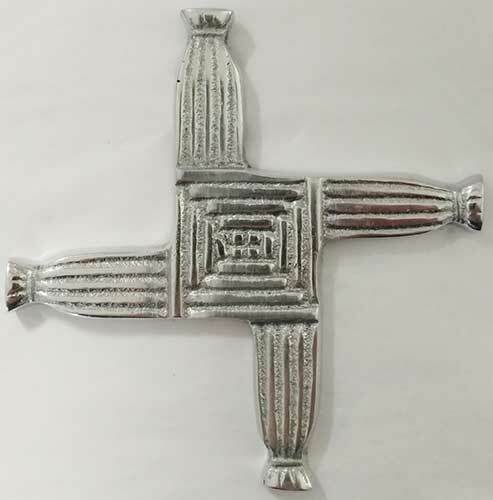 St. Brigid's wall cross is small aluminum design with a silver tone color. This small St. Brigid's cross for the wall is made of aluminum and measures 3 3/4" wide x 3 3/4" tall; it is enhanced with embossed detailing. The ready to hang St. Brigid's wall cross is made in Ireland by Liffey Artefacts and it is gift boxed with a St. Brigid's history card, complements of The Irish Gift House. St. Brigid's wall cross is small green porcelain design with a textured finish. St. Brigid's wall cross is made of aluminum and features a silver tone color. St. Brigid's wall cross features a dimensional brass design that is enhanced with embossed detailing.